This is my first time coloring white and I'm not sure I like it but it's done. I made this card for my mom. I figured I would try the all white challenge over at Magnolicious. I made it a little more bulky since I will be hand delivering it. This is so pretty. I really like the snowflake frame around Flying Tilda. The white with the splash of rich color is gorgeous! Very nice - I like this a lot! I like it VERY much. Especially the colour of the face. It’s a very beautiful card. Wishing you blessed holidays and a prosperous New Year. You have done an excellent job with the Challenge!! 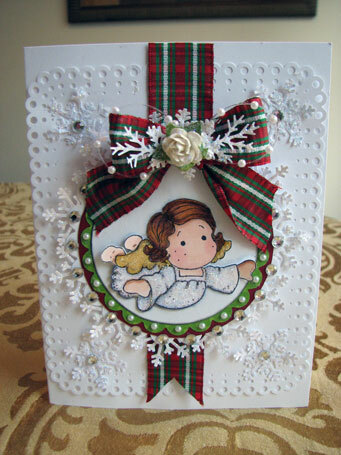 I love how you have decorated your all white card with the punched border and wonderful snowflakes all around your image. The awesome ribbon and rich coloured circles around Tilda show her off to perfection :o) The added rose and leaves are a very special touch on the ribbon, as are the pearls around your image. Hi Julie! 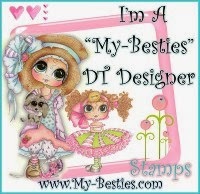 Your card is wonderful....beautifully colored image showcased with expertise! Love the stunning ribbon! Oh Julie! What a BEAUTIFUL card! Looks very Christmas to me! Good job! Gorgeous design Julie. Love how you have the ribbon and Tilda is colored beautifully. Wow, so cute. I really love how you've decorated this card and especially the scalloped circles with the snowflakes.